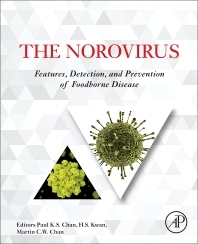 The Norovirus: Features, Detection and Prevention of Foodborne Disease is a unique and valuable reference for both researchers in industry and students who need to understand how this specific pathogen behaves in order to improve control of food as a transmission of this infectious biological agent. The information in the book provides essential, specific information to help further understand potential new strains of the pathogen, offering detection analysis and prevention strategies of the pathogen to assist in combatting the spread of foodborne illness. Written by national and international experts in the field, this book will be a practical source of information for food scientists, food microbiologists, food technologists, food industry workers, public health workers, and students. Paul KS Chan is the Clinical Professor and Chairman of the Department of Microbiology, and Deputy Director of the Stanley Ho Centre for Emerging Infectious Diseases, Faculty of Medicine, The Chinese University of Hong Kong. He also serves as Honorary Consultant in Microbiology for the Hong Kong Hospital Authority. Professor Chan obtained his Medical Degree from The University of Hong Kong in 1988, and completed a Master Degree in virology at The London School of Hygiene and Tropical Medicine, The University of London in 1994. He received specialty training in clinical virology from the Virus Unit of Department of Health, and obtained a Doctoral Degree from The Chinese University of Hong Kong in 2003. Professor Chan’s research mainly focuses on human papillomavirus and human respiratory viruses covering epidemiology, diagnosis, pathogenesis, treatment and prevention. He is the convener of a multidisciplinary research team “HPV Research & Education Consortium @ CU Medicine”. Paul KS Chan is the Clinical Professor of the School of Life Sciences and Director of the Food Research Centre at The Chinese University of Hong Kong. His research interests are genomics and functional genomics, molecular genetics and genomic analysis of bacteria, fungi and marine animals, food Safety and authentication, microbiology, molecular biology and biotechnology, and molecular analysis of Chinese medicine and food. Paul KS Chan is a Research Assistant Professor in the Department of Microbiology for The Chinese University of Honk Kong. His research interests are norovirus molecular epidemiology, gut virome, virus discovery, and food virology.